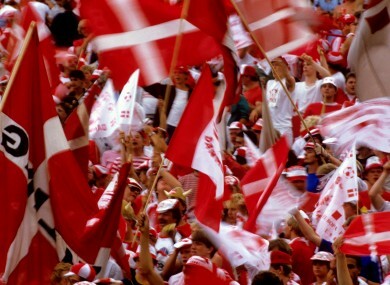 Sepp Piontek’s vibrant Danish side never fulfilled its potential, but the lessons of its failure paved the way for the most unlikely of tournament victories in 1992. A HEADY COCKTAIL of immense natural talent, tactical nous and Scando-rock hairstyles, the Danish international side of the 1980s never quite ascended to the heights for which it seemed destined. For while it could boast of Michael Laudrup, Preben Elkjær, Frank Arnesen and Martin Olson, not to mention the innovative guidance of German coach Sepp Piontek, Denmark was a side defined ultimately by a refusal to relinquish its status as the decade’s most elegant underdogs. Self-deprecation, irony, a commitment to off-duty “relaxation”: these were values that could add an air of romance to group stage victories over Belgium or Yugoslavia, but they proved brittle when set against the unswerving self-confidence of West Germany or France. “While Laudrup called them ‘Europe’s answer to Brazil’, most went for what was probably an even more flattering comparison: they are the only side to have been widely compared to the Dutch team of the 70s. In that respect, Denmark were both derivative and thrillingly futuristic… No team has ever had such a collection of jet-heeled dribblers. Semi-finalists at the 1984 European Championships, the victims of merciless thrashing at the hands of Spain in the second round of the 1986 World Cup, Piontek’s Denmark appeared by 1988 to have squandered the promise of its early years. Retirements, frustration and the mounting fear of aggregate failure each conspired to chip away at the incisiveness that had set the side apart. The result was a dismal European Championships campaign and, it seemed, the collapse of Denmark’s dream of lifting a major international trophy. Piontek departed in 1990, sparking a long-running and farcical search for an adequate replacement. The appointment eventually fell to Richard Møller Nielsen after German Horst Wohlers failed to extricate himself from his contract with Bundesliga outfit Bayer Uerdingen. His authority immediately undermined, Nielsen assumed tentative control of Denmark’s nascent Euro ’92 campaign. Struggling against a rising tide of skepticism and dissent, the Odense BK veteran guided the squad to an early victory over the Faroe Islands, but suffered catastrophe in the shape of an away draw with Northern Ireland, followed closely by home defeat to Yugoslavia. The Laudrup brothers and Jan Heintze abandoned the squad, demanding the coach’s dismissal in exchange for their future cooperation with the Danish FA. Shorn of the remnants of Piontek’s legacy, Denmark would struggle on, winning their remaining matches to finish second in the group behind Yugoslavia, agonisingly short of qualification. Cue the chaotic break-up of (the Socialist Federal Republic of) Yugoslavia and the Scandinavians’ sudden reinstatement among the European elite. Nielsen’s men – still without the more talented Laudrup – arrived in Sweden emboldened by their good fortune and determined to eclipse the successes of their more storied predecessors. Email “48 days to Euro 2012: Danish Dynamite explodes years late”. Feedback on “48 days to Euro 2012: Danish Dynamite explodes years late”.